Marc lee I’ve only done otr I have done Kohls acct to help out right before Christmas out of Findlay OH. And I worked on the Walmart acct. out of woodland pa. I’m not to crazy about the dedicated stuff maybe if I could get home for resets but based out of eastern nc it’s hard enough to get a load within 200 miles from home for time off. Did deliver about 30 minutes from home once that was cool but hard at the same time because I still had a week before home time. The Kohls acct had a lot of double drops also. And the other driver that commented from Jb is right about the small company feel. I forgot his name and worried if I go back to look I’ll have to start this over. I’m called by my name treated very well and like to think I have a good relationships with people I’ve never met. As far as targets go I’ve only been in a few dc’s but they are very well marked and easy in and out one of my favorite places to drop. I p/u from Nfi a lot in IL think it’s edwardsville by the rail yard and the refinery might be Joliet can’t rember the town either way be careful in there dropping and hoolking it’s very tight. Well I look forward to following your training. And am curious how the target amazon acts. Work my wife says they should offer me a job with as much as I order. Anywho stay safe and best of luck. Oh and don’t forget drive like a champion!! Thank guys if not for tt I’d probably still be on a lift loading truck and dreaming about driving them. And Marc lee no apologies needed that was funny and also if you have any questions if I can answer them I will. I wish you well and hope your experience is as great as mine has been if you don’t mind me asking where is your orientation? Hey guys just checking checking in and letting everyone know how it’s going. And so far it’s great. I’ve been with Jb 7 months and just got my fourth truck. Sounds crazy but only one breakdown I haven’t been messing them up first was up for trade second broke down and after 4 days the said u can wait or repower and last night they sent me in for a detail for company event and said here just grab this one a new cascadia. Fm called me bout 20 minutes after said hope you like it you earned it. It’s got the auto trans it’s pretty cool but I reach for the shifter that’s not there. But things have been great. I went in with the starter company mindset because that’s what everyone was telling me there a good starter but Brett’s about that has proven to be correct why would I want to start over. Things are great here money miles and most important the relationships I’m developing when my fm and I chat on the phone we talk like friends or coworkers not boss and employee. He keeps me moving and I try and keep him busy by trying to get unloaded early or whatever I can. I don’t complain just take my load and carry on. And usually there’s a awesome load right behind it. I was late once I mismanaged my time that was a hard lesson learned not was i late on that Load but now I was late on the next three on one end or the other. Thank god I ran out of hours and was able to reset. I found out the hard way why everyone says don’t EVER BE LATE. And about communication we talked about it and so far all has been well. I’ve gotten a raise a new truck and now an invitation to hq for lunch and a tour. But I know I haven’t made a year yet but I don’t see myself going anywhere anytime soon. To me a year is just a milestone and a goal just to say I have made it. It’s been hard sometimes it’s like everything is against me and mostly it’s I can’t believe I’m getting paid for this. I’ve tried 3 dedicated accounts and it’s just not for me once was just to help out before Christmas. But I just can’t stand the same places same roads over and over it was making me crazy. I’ve almost hit 3000 miles twice it’s a personal goal. But other than that things are well backing is getting better and trip planning getting a lot better at first I was 100 miles past where I wanted or short now I have plans a-z. Things change at moments notice. I still stay out a month at a time and life on the road is becoming second nature and the coming and going is getting easier with the family. I think the biggest part about anyone considering a career is to stick it out it takes time to found out if this is for you. It’s going to be hard real hard but if your a go getter a hard worker and can keep a good attitude you will survive. And what ever you do don’t be late because if you out you’ll probably be late for your funeral it really throws a wrench in the mix. But 7 months in I’m having a blast and there are times I’m down and consider a different path but I get on here and get my self back on track. So for now I’m done rattling on y’all stay safe. All this talk about protection me personally I sat if they want it they can have it it can be replaced. I’m going to try and keep it from happening but I don’t care about this truck and load as much as I do me. If I think my trailer is being broken into I’ll call 911 but I’m not gonna run out there to stop them. Now if there trying to get in cab all bets our off I will defend my life till my last breath. Even with wasp spray if need I do keep my thumper by the door straight razor in sleeper and my belt knife on my side. But I always say better to be tried by 12 then carried by 6. And sometimes I’ll carry my keys in my fist for a punching stabbing kind of way if the area I’m in makes me nervous. But I’m a always looking over my shoulder kind of person. I would like to open carry out here but company policy and varying state rules make it impossible. But also that cb mic could make a great weapon also think about that thing whacking someone. Starting on month 4 of my new lifestyle!! That’s a great article old school you know I tell everyone it’s all about the kids. We were talking about blowing the air horn and jake brakes in orientation and how it’s illegal in town and the restrictions and I said I’m sorry but I’ll blow the horn in church if a kid starts pumping that arm. Thank you all for your great advice and help along in this lifestyle it’s not a job or career but simply a lifestyle. Jersey for starters I’d like to say thank you for your service to your community. I considered my self a young buck in the trucking industry but in my 33 years of life and 28 years of wanting to be a long haul trucker. Here is my two cents for a almost four month otr rookie. I drove 10 months local and myself was worried about choosing the right company. I thought oh no there bad there good and so on. Then I found trucking truth. Did trucking truth help me decide who to work for no but they gave me a good idea of what I was getting into. Actually the company I wanted said no with out a year experience. I wound up here at Jb hunt and couldn’t be happier. I quit my local job on my birthday a 1 pm and was pre hired by 5 you know how I chose I put in 5 apps they called back first the rest was blowing me up while on the phone with them what you hear about a company don’t mean anything. There all good companies you just have to prove your self. Work hard have a good attitude and give it all you got all the time. After I got hired here people were oh there good others were there bad either way they pay. I’m happy here never even considered this company for everyone says oh there a starter company. I talked to a driver the other day and he’s been here 14 years never considered anyone else. But that shot in the dark has made me more money I ever thought possible. I’ve worked hard really hard and kept that good attitude. Because there testing you there always watching not in a bad way but there gonna see if your using your clock up or shutting down early every chance you get and not delivering early when you can. In my three months I went from .41 cpm to .55 cpm and a promised pay of900 gross if I turn less than 2000 miles. Great for that week I take home time. I’ve gotten a New fm last one got promoted and now my runs have really gotten longer before they were 300 to 500 miles to now 500 to 1000 and tighter appt. windows now I’m on Walmart store delivery’s they offered a bunch I finally took it bc to be honest I was tired of them asking. It’s not all over the place but for now it’s different and they give me a route turn for turn mileage and there are only three appt windows. And more than ample time to make delivery. So don’t get hung up on what you have heard about a company call them ask questions write it down compare companies on who seems like they may have the options you need for a balanced life like home time options what divisions do they have can you switch if say you don’t like flat bed which is a ton of work before you work strapping tarpin load checks I strapping trapping in the rain snow wind cold hot. Think of it like this did you research police forces before you went to the academy. You just got to go into this head first ready to work and don’t expect anything but to get ready for possibly one af the hardest things you will ever do. It has been for me I bet I wanted to quit 100 times my first assignment and that was just to bob tail and grab an empty then we had to go get loaded and drive 500 miles oh boy was quitting on my mind a lot. So don’t let what you have heard steer your decision. Or decide your fate don’t expect 1000 mike runs and and new trucks and easy appt. times it’s gonna be hard no matter the company. Best of luck to you sir and the best thing you can do for help is study up on here research ask questions. And prepare for the longest job interview in the world I think is how old school and Brett puts it. Sorry I’m all over the place I’ve never been good at putting my thoughts into words. Best of luck!! Thanks guys and I love my cb at night it’s quieter and mostly useful info. I try and keep my cool out here I was always taught you catch more flies with honey than vinegar. So I try and stay easy going and just let things roll of and yesterday was just one of those down days. But the good has far out weighs the bad. We’re all gonna have bad days no matter what we do. But looking back it wasn’t really so bad I got to see the space shuttle at the rest area well drive by I got to deliver 3 hours early and was able to pickup early boogie back to Illinois deliver early again and pick up and almost nock this load out early but I had to shower. It luckily was just really a bad half day missing my kids but got on the phone and got over it. And if all goes well I may have close to another 3000 mil week. I haven’t broke it yet but it’s one of my monthly goals. My best was 2979. But like trucking truth has taught me is trucking is performance based they harder I work the more we all make. Thank you all for your help it’s nice have somewhere to go where we can all relate in on way or another and if nothing else’s pick each other up and dust our selfs off. My buddy was regional and he just turned in his keys and took his local job back where we worked together so y’all are filling that gap for me. We never bumped into each other on the road he was always going where I was leaving or vice versa. And even with that I felt like I had someone out here with me. Then I remembered I had my TT FAMILY. I can’t say it enough thanks again for all your help and kind words everyone. And as always stay safe. And if I ever bump in to one of you guys the next cup of joe is on me. One at a time though I have kids there expensive lol nite guys!! Hi guys hope everyone is staying safe. I’m back on the road. Thought I’d give everyone a little update while I cook my dinner. So I’m bumping along happy as a pig in mud to finally be solo otr. And it finally sunk in that trucking is not what I had pictured it to be. Not saying I’m not happy because I am. I think I watched Smokey and the bandit and Convoy one too many times growing up. It’s just I can’t believe how we as drivers treat one another I wanted to throw my CB out the window to all I was doing was passing along info me and to other trucks had stopped in the road for something up there some one was messing up merging I dunno but we had to stop fast. I called out on the CB hoping to not get rear ended I was told to shut up stupid. I was bad and stopped to his level and put in my two cents. And I promise this did not help the situation. You can call me what you want but stupid I don’t take lightly. So I pulled in the next rest area calmed down turned the cb OFF AND MOVED ON. But I just can’t get over how we treat each other out here I always try and help when I can even if is backing off to let a truck that’s 1mph faster get on by. Or just holding the door at the truck stop for they guy behind me. I even gave a driver one of my showers because he was out of shower credits I had extra. I guess I just thought there would be a little more of a brotherhood out here or sisterhood out her but it’s not. Don’t get me wrong I’ve had folks see me struggle to park and they have came from as far as ten spots away to help while the guy I was parking next to just watched ready to blow the horn and wake the neighbors. And you can bet your bottom dollar I’ll jump out and help someone backing up. But I guess all I’m trying to say is we’re all going somewhere and have the same clock we need to help each other. Anyhow, life on the road has been good hard but good. I’ve seen a ton and I love the challenge. I also learned that if your freight manager finds out your scared of something your going to get used to it quick. My first time in Chicago I was lost low bridges everywhere and the week before my fleet had 3 topped trailers and 2 roll overs in there. So I was on high alert extra careful plus I’m from a two stoplight town haven’t seen many big cities. Just passed through Atlanta couple times. Called in for directions got what I needed and he said can I help you with anything else? Me and my big mouth said no sir just get me out of here I’m scared to death of this place. I spent the next three weeks in and out of Chicago. It could have been that it was just the way freight was moving. But I also feel that if I’d just shut up I may not have seen so much of the Windy City. It doesn’t bother me as bad now but I still don’t let my guard down it’s a tough drive at least for this rookie. But all in all I couldn’t be happier got a new fm last one changed positions got a raise so I’m not complaining. I’m still having the time of my life. Meeting new people I like to talk to the rest area workers there great. I always thank them for what they do. And sometimes you get a cool story in return. And guys and girls let’s remember to be safe and respectful we’re all we have out here. Let’s help each other. And thanks again everyone for helping me keep my head on straight and the great advice and information. No problem glad I’m helping. It’s rough the best thing you can do is stay positive. Try to find the good in every situation. Like when it took you 45 minuets and 100 pull-ups to hit that dock yeah you lost a bunch of time. But you also learned to. So far the hardest thing I do is backing and learning the hours of service. It will get easier before you start backing look at your situation plan it out turn the cb off and GET OUT AND LOOK every single time things change fast. I’m still really green and I struggle a lot but that positive attitude goes a long way. Find the best no matter how small and it will make the difference. Like I was taught when backing set your self up for success. If there is any way I can help let me know. Stay safe out there you got this. And you guys couldn’t be more right about that. I was solo the day after I got my license. I have ten months of horror stories. It wasn’t all bad there were a lot of good times but having to drive through sub developments and other parts of town that weren’t meant for trucks was a hard schooling. But my only mishap was a mail box. Trailer kicked in the culd-sac turning around. I replaced homeowner was happy boss was happy but I was a nervous wreck. Anyway now that I’m getting better at time management I will try to post and comment a little more often. I’m setting my wife up on here tomorrow so she can read along also. I talk about you guys on this site like y’all live down the street. But for now y’all stay safe out here!! Do you have the Trucker Path app on your phone. It can help you find parking. Good luck on your continued OTR success. Yes sir a friend of mine told me about it and it has been saving my behind ever since. I like to pair it with google maps. I DO NOT USE GOOGLE MAPS FOR DRIVING. But it’s nice to bring up the satellite view and get a good look at how to get in these places. And I am also glad to see that there are some drivers out here and help you get in a tight spot. Because I will jump out and help a guy or gal back in in a heartbeat. It’s always nice to talk to some of the experienced drives and get a few pointers or just chew the fat. Hey guys I finally went otr. I sighed on with JB HUNT couldn’t be happier. I was just reading over old schools post about not starting local. That’s what I did a year ago just noticed I have had my cdl a year. I have been signed on since may. But he couldn’t be more right about that from my standpoint. I’ve been following along on here for a while researching otr. And boy do I wish I had started out otr but at the time the offer was on the table for the building supply I was working at. I QUICKLY found out that I was in for a rude awakening. But I am learning quickly. They only require me to stay out 14 days min but so far I’ve stayed out 28. I’m wrapping up my second trip out tomorrow. Quoting old school here but I read somewhere one here look at training like boot camp. And I’m doing just that. But they also didn’t send me out with a mentor they put you through orientation have you complete Smith system training road test you and send you on your way with a mentor book onc book and some phone numbers. Guess this approach works. It’s working for me but it’s not for the faint of heart I had never pulled a van on flatbed not seen on obc till orientation. I bet I quit 100 times that first day but I remember what Brett said and that was if you don’t give it a year you never really gave it a chance. I have been working at it I’m getting better every day and my time management skills are slowly getting better. No preventables so far hope to keep it that way. But that first week was the hardest time I’ve ever had in my life everything was hard parking going in and out of the truck stop backing in some of the tiniest spots and to top it all of trying to figure out where to shut down. I lived off of pb&j and got stuck in some odd spots for the night. Like I didn’t know parking would be a big deal in West Virginia at 9 pm I thought I’d just pull in a rest area. I slept on a side street next to a small car dealership. But it’s getting better I still struggle ALOT but I almost hit 3000 miles last week 21 short. But they keep me busy and we communicate well i take every load I can make and have got a couple appointments moved up. Thanks for that advice Brett. Even hit Wally World a couple times for the night a restocked wouldn’t have know that was possible with out reading Rainy's post. So I guess what I’m getting at is really just a thank you to all of you guys for the great advice to help me know what I was getting into. 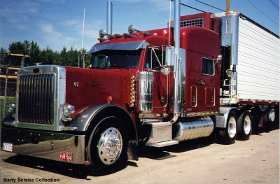 And what I hope to be a long career in trucking. I love otr it’s different everyday and a new challenge. It’s hard on they family but we spent a year talking it out and planning my kids know what’s going on and they understand. And I just read an article the other day by Rainy I think it was about otr relationships and that has helped my wife and I understand each other a little better. And technology helps tremendously. Also if anyone has questions about Jb hunt I will answer to the best of my knowledge. I know I didn’t mention all of the moderators on here but am great full for you all I just can’t remember everyone’s names. Thanks again guys!! Hey guys here is one I took on the beach of eastern nc. I’m still a local driver for now so I don’t get quite as many photo ops as most. Hope y’all enjoy it. And have a safe and merry Christmas!! Otr down the road. Do I stand a chance?? Well that's good to hear. I was going to go to a private school but the cost with two school age children was out of the question at this time. And I was nervous of signing a contract from fear that it may not be for me or that my family would be ready for the separation. I also figured if all else fails it would be a great fall back if things didn't work out. But who knows I may never go anywhere I work for a great company but the benefits are good the money is ok but the people I work with are like family. But I like to know what options I have. But one day I would love to try otr. As for now I am getting more comfortable behind the wheel shifting is getting better and I backed a little to day. So again thank you all for the advice. And here is to hopefully a long and safe journey into my trucking career. Thanks for you help guys I'll keep all that in mind. I've been following along for a while and it was this blog that gave me the courage to start taking the plung towards my cdl. It's been a childhood dream. And my wife and I decided this would be the year. But for now I tip my hat to all of you and stay safe. And if I'm lucky we may pass by each other at one of the eastern nc ports or truck stops!! First of all thank you for such a great site. Ok here goes I work for a local building supply and they are helping me get my cdl I have my permit and am now in a 48 foot flat bed bouncing between two trucks and trainers. Anyways what I'm getting at is I don't want to stay with this company for ever I eventually want to go otr not any time soon but after I get some experience and my kids get another couple years older I was just wondering if I had any kind of chance at getting hired with no otr experience and not going to private or a company training program.